After weeks of rumors and speculation, Handspring has just officially announced the Treo 90, a new mid-range color handheld. Despite being part of the Treo line, the 90 isn't a smartphone. It also isn't a Visor, as it lacks the signature Springboard slot. Instead, the Treo 90 is the first Handspring model to have an SD slot. In another first for the company, this is the first Handspring model to use Palm OS 4.0. It also has a built-in keyboard and 16 MB of RAM. The screen has 12-bit color, rather than the 16-bit color on most other color Palm OS handhelds. This means it can display over 4,000 colors. It is the same screen as on the just-announced Treo 270. Like the rest of the Treo line, this screen is slightly smaller than the display on most Palm OS handhelds, though it uses the standard 160 by 160 pixels. The screen is CSTN, or Color Super-Twist Nematic. Though a passive matrix type of screen, the newest CSTN displays have good refresh rates, wide viewing angles, and bright color that compares well with TFT displays. And they cost about half what TFT screens do. According to Handspring, the screen is usable outdoors, though the colors aren't as good as they are inside. Handspring has dropped the proprietary Springboard slot for this model and is instead using the more standard SD one. Several other Palm OS licensees have SD slots in their handhelds, including Palm Inc. and HandEra. With over 70 different types of Springboards, from modems to cameras, the Treo 90 is giving up functionality but it is saving on size. The SD slot, which also can use MMC cards, will allow the Treo 90 to expansion memory cards for backups and storing more applications and files. Of course, it uses the VFS standard. One fact about the 90's SD slot that is sure to disappoint some is it doesn't support SD Input/Output (SDIO). This means it won't be able to use Palm's SD Bluetooth card or any other SDIO devices that get introduced in the future. However, Handspring is considering offering a software update for this model that will let it support SDIO. There are cables which allow this handheld to be connected to many types of mobile phones and it can connect to some mobile phones with infrared. The Treo 90 has 16 MB of RAM and is the first Handspring model to make the jump from Palm OS 3.5 to 4.1. This is probably because it made it much simpler to support the SD slot. It runs on a 33 MHz Dragonball processor. It doesn't use flash ROM so its operating system can't be upgraded. However, even if it could be upgraded, it wouldn't be able to use Palm OS 5.0, which should be out soon, because it has a Dragonball processor that isn't compatible with the new operating system. The Treo 90 is 4.2 by 2.8 by .65 inches (10.8 x 7.1 x 1.6 cm), which is very close to same size as the rest of the Treo line. It weighs only 4 ounces, making it the lightest Palm OS device available. The casing is plastic, which is part of the reason the unit is so light, and is colored a metallic bronze-brown. It uses essentially the same QWERTY keyboard as the rest of the Treo line. Because of these, the 90 has no graffiti area. Handspring has no plans to introduce a version without a keyboard. The Treo 90 doesn't come with a cradle. Instead it has a USB cable that allows it to HotSync. This is a single USB cable that splits with one strand for data and another that plugs into a wall socket for power. It uses the same HotSync port as the rest of the Treo line and therefore a cradle can be purchased separately. It has a removable flip cover with a clear window in it that allows the screen to be seen without having to open the cover. Along with the standard Palm OS apps, it comes with Datebook+ and a new app called Contacts, which is an improved version of the Address Book. The Treo 90 also comes with a copy of Blue Nomad's WordSmith word processor, which allows Microsoft Word documents to be accessed on the handheld. It has both Mac in Windows conduits. It also comes with the Blazer web browser; One-Touch Mail, which is POP3 compatible; and the Palm SMS messaging app. Last month, Donna Dubinsky, Handspring's CEO, said her company would be releasing a new device that is not a Visor . She said it would borrow some of the design characteristics of the Treo line but not be wireless. Clearly, the Treo 90 is this device. 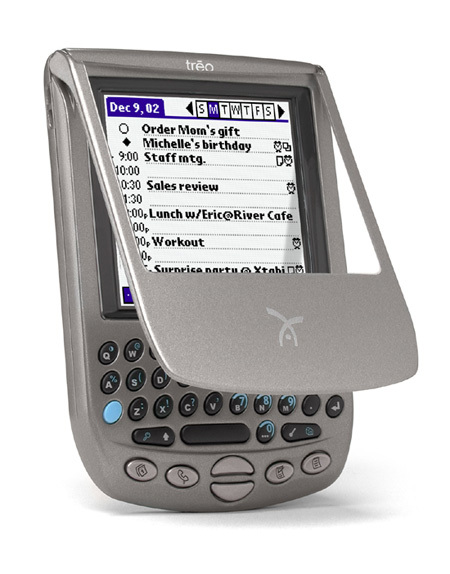 Handspring looks on the Treo 90 as an entry-level model. It hopes people who get a one and are satisfied with it will eventually upgrade to one of the versions of the Treo with a built-in mobile phone, like the Treo 270. PIC: Rumor: Is the Treo 90 Handspring's Mystery Device? The Buy-it Now link for the Treo 90 is broken. You cannot get past the 'select cable' page. I am assuming this is because this is where you normally try to select a service provider, which is not needed for the 90. BTW, I don't like the plastic case, but w/ these features, it should blow the m130 out of the water. Welcome back to the Palm OS community, Handspring! "it should blow the m130 out of the water. " You're kidding, right? Please tell me you're not really that stupid. are you really that stupid to believe it WONT blow the m130 out of the water? have you taken a look at that sh*tty screen on the m130? the 8mb of internal ram? its size? the keyboard on the treo's are second to none because of their integrated enhancements to the palm OS....i am with the above poster...this will blow the m130 away. Sarcasm aside, this half-assed device is still priced more than the m130, and "Treo" has little to no brand recognition to support it. That's what consumers will see when comparing the two. Side by side I think it compares quite favorably to the m130 (based on specs, as I haven't seen one yet). One of the important things is that this device gives Joe or Jane Consumer the option of a PalmOS device with keyboard input. So perhaps the Treo 90 fills an important niche, offering yet another variation on our beloved PalmOS devices and *broadening* the market appeal....! is the flip cover protecting the screen? i cant tell if the flipcover has a glass cover or not. but i think it would be stupid to leave the screen unprotected. If it is like the other Treos, it has a built-in screen protector at that part of the lid. can the flop cover turn the power on like Treo 180's ? This will attrack more people on the palmpilot. coz some gets turned off when they see some scriptures of graffiti shown to them that they have to memorize each strokes. I know graffiti very well but im still considering of buying palms minikeyboard for the m505. are some of you really that stupid to think that someone new to palm is gonna turn up buying a COLOR pda with a built in keyboard and more storage room? plus im sure the screen will look better, even though it displays less colors...that m130 screen makes me wanna puke, because of the ghosting effect. not to mention the treo is much smaller, much thinner, much lighter than that m130. whats this talk about a jog dial? does the m130 have a jog dial? NO! so you cant use that as an agrument to buy the M130 over the T90. plus, the treo makes up for the lack of a jog dial in that you can scroll through your apps with the scroll button and select them with the spacebar. how simple is that? side by side, the t90 is better than the m130, hands down. the only reason someone shouldnt buy the t90 is if you absolutely hate built in keyboards and require the use of grafitti. BTW, the up/down buttons on the 90 have been revamped, so along with the spacebar, they can perform all functions of a jogdial. ill buy it if i have accessories to use it with. ...with the digitized screen, users can take advantage of third-party applications like RecoEcho 1.1, for example, that allow you to use on-screen Graffiti in addition to the keyboard. I'm considering getting one... if they enable SD I/O! Do you mean accessories as in pen/styli (which I, for one, hope we'll see soon, i.e. a Pentopia Chameleon) or SD add-ons (if/when SD I/O is enabled)? It is always refreshing to read comments like "your stupid!" and "half assed device". Clearly the Treo 90 will appeal to consumers, although it remains to be seen whether it will out sell the M130. Will the lack of graffiti be detremental, will the 12 bit color bother consumer, will the lack of flash memory matter or will the plastic case be a problem? Who really knows. To some people these are issues and they probably won't but it. To others these concerns are trivial. Perhaps the best thing to do is wait and see what happens. It should be noted that the lack of flash memory is a complete non-issue. Even if the Treo 90 had flash memory it still would not be possible to upgrade to OS 5 as it is written for ARM processors. I wish that HS would release a graffiti model because I would buy one in minute. However, in order to expand the consumer base and provide real alternatives, this is a necessary move. To say that the Treo 180g out sells the 180 and therefore the 90 should have graffiti is very short sighted. The Treo line has not been out long enough to have achieved any real market penetration. To date the majority of people buying the Treo have been Palm users switching from other products. Since they already know graffiti they flock to the 180g. As soon as newbie consumers begin buying this product there is every reason to believe that the key board version will be popular. It is difficult to see consumers new to the Palm world being interested in learning graffiti when a keyboard version is available. In the end anyone interested in furthering the Palm platform should hope that Handspring succeeds. In my opinion what HS, Sony and Hand Era are doing is great. They provide viable alternatives to Palm prodeucts while furthering the Palm platform. I have no desire to live in a Pocket PC world and applaud HS for these innovative new products. One final thing, if you can't say anything positive or productive, please don't post at all! Finally... what took them so long?!? I am so glad that handspring has finally joined the market again. its perfect, cheaper then the T615 with a keyboard and color screen. Although i wish it were 16bit color and not 12 but hey whatever gets the party started... also i think its odd they added an SD slot but a smart move at that. sadly i just bought a Vx and friday an NR70... otherwise due to my love of handspring i would have bought this. cant wait to try it out at best buy though thats for sure. RE: Finally... what took them so long?!? First, the color, why 12bit color? The only reason I mention it is that both its competitors (Palm and Sony) are 16bit color which simply doesn't look good for Handspring. Second, why did they take the jog dial off the Treo 90? Is a jogdial really that expensive to manufacture? Perfect? Without Grafiti? Ick. Thumboard keyboards are a right royal pain in the rump. Also, having tried WordSmith, I wouldn't say that it makes up for not having Grafiti. I'll wait for OS5.0 devices before this thing. This 90 could be the right one for the mass. Let me tell you a fact. I bought 2 refurbrish Visor Deluxe as an award to 2 of my top real estate agents. My purpose is to have them use the program Loan Realtor. They end up giving them up to their kids, for Palm OS is still a pain to learn, though they both have degree in PhD! What can you say? I say "The Institute" shouldn't have let them out of their padded cells. They probably use their PDA as a chew toy while they listen to old German Waltz's in the attic. I'd say fire the PhD's and hire their kids if they can't figure out a device so simple to learn. Most of the professors at the college I just attended had no idea how to program their VCRs. Seems to be a typical lack of interest in actually learning the technology they use. Which was annoying, since I worked the tech support department there. "Why doesn't my computer work? What do you mean 'power button'"? Ugh. Heh, that's right all you PDA geeks, instead of looking at the fact that Palm OS PDA's are having trouble adapting to people who are clearly intelligent, we should blame the people for not adapting to the PDA's!! 2) vibrating alert? Again no mention. 3) speaker or crappy little piezo? Again no mention. In all, it's pretty strong competition for the m130 for "entry-level color" segment of the market - I have a feeling this device should do very well! Go Handspring! :-)Of course, for an extra C-note buyers can get an m515, T615C or an NR70. Well, it sure is interesting to watch the evolution of the Palm (Family) Tree! PS Ed, you note at the beginning it's running OS 4.0 (though later you correctly state 4.1) - might want to fix that! Gaving three or four letters next to your name does not make a person intelligent. Intelligence makes a person intelligent. How exactly would an intelligent person "Gaving three or four letters next to their name?" 3 or 4 letters: you know like Ph.D (aka Piled Higher 'n Deeper). "Gaving"?!?!? Dude while youre too busy tripping over urself defining intelligence...you might want to check yourself first! Write something, look at it, check it again then send! "Third, why not name it Visor? Visor has more name recognition than Treo and plus Treo stands for the three functions that the Treo can accomplish and since the Treo 90 isn't a phone..."
Um, is it possible that they are calling it a treo because of the form factor? But of course we should excuse the "urself", right? Follow your own advice and don't let sloth dictate your spelling. Who is this "Sloth" and why does he care about his spelling? Quote: "The screen is CSTN, or Color Super-Twist Nematic. Though a passive matrix type of screen, the newest CSTN displays have good refresh rates, wide viewing angles, and bright color that compares well with TFT displays. And they cost about half what TFT screens do." Is this the same type of display used on the Clie T615C? RE: Question regarding the display..
No, all other T615c uses TFT active matrix. I am skeptical about this description "the newest CSTN displays have good refresh rates, wide viewing angles, and bright color that compares well with TFT displays". I would reserve my judgement until it comes out. Passive display used to have narrow viewing angle, diluted colors, and looks significantly inferior when placed next to a TFT display. It was previously used for budget laptop, but it has now been completely replaced by TFT since TFT's price has come down. The T615 is not active matrix TFT, Palm IIIc and Visor Prism are. The screen used in the T615 and NR70 series is a trans-reflective (i.e. partial reflective and partial translucent) TFT screen with backlight. That's a totally different technology to active matrix TFTs. Trans-reflective TFT w/ backlights and fully-reflective TFT w/ frontlights are completely viewable under sunlight, while active matrices can't. That are my words. SD card with no Bluetooth support????? With devices like this Handspring won't survive imho. I don't hope it. "Come on Hand you can do it". Aw c'mon -- Bluetooth is still a very leading edge technology, and anyone buying Bluetooth will probably also be opting for a top-end device. Don't forget, Palm's Bt SDIO card is almost half the price of the Treo 90 (US$129).